Amer Fort, Jaipur. 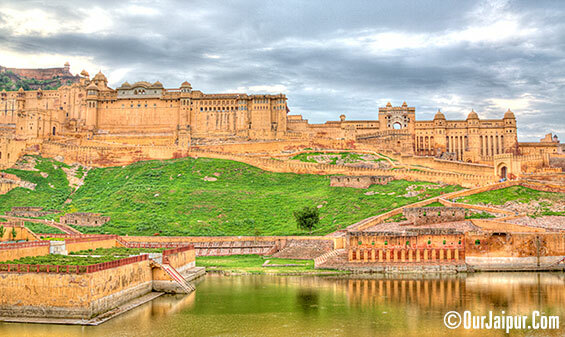 Also known as “Amber Fort” is located about 11Km. from Jaipur. It is one of the most famous Tourist attraction located on a hill. 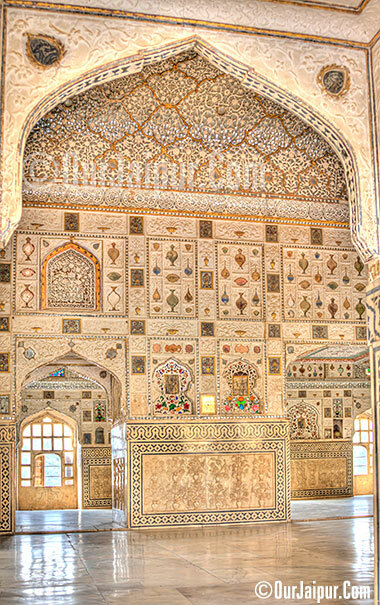 Amer Fort is known for its architecture and beautiful elements with which it’s decorated. And the whole fort is facing the Maota Lake. Which makes it a Picture Perfect. 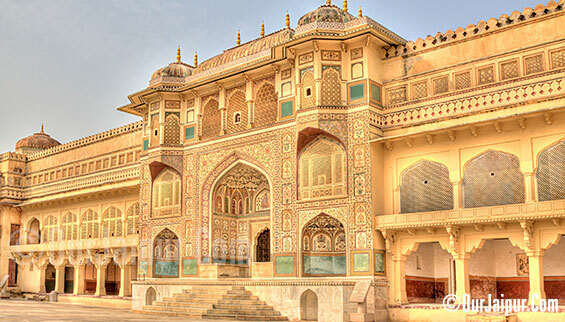 “Amer Fort” is one of the most important tourist destinations in Jaipur and it is Highly Recommended. Amer Fort at Monsoon time. History of Amer Fort is very old, Amer Village in which Amer Fort is located right now was once a small place built and rueld by “Meenas”. In 11th century “Kachwahas” came to rule “Amer”. 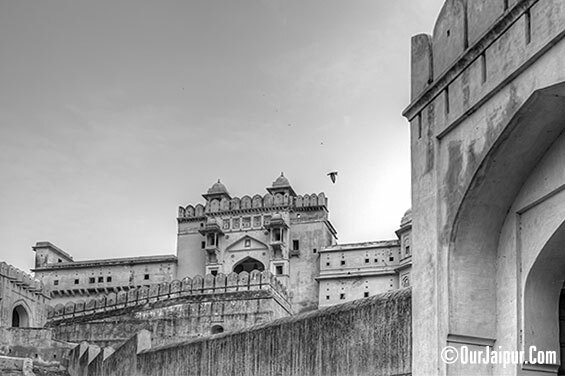 From then onwards “Amer Fort” started its Journey. 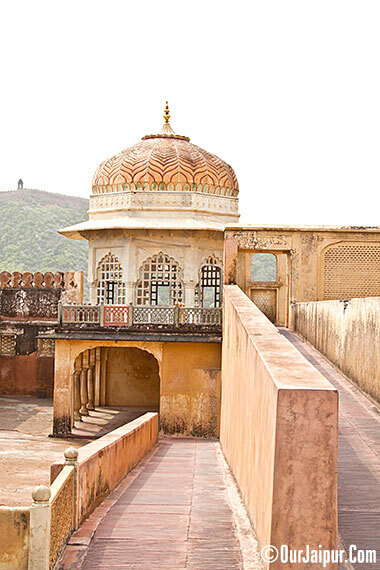 The earlier structure was built in the Rule of “Raja Man Singh” and from then on it was in the continuous process of expansion and improvements till 1727 when “Sawai Jai Singh II” has shifted his Capital to Jaipur. 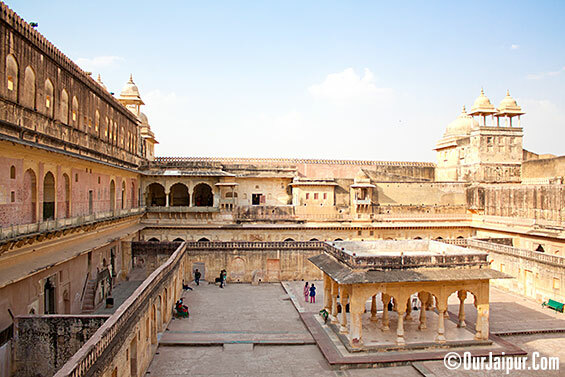 The Amer Fort is basically divided in four sections with their courtyards. Main entry to Amer Fort is through the Suraj Pole Gate (Sun Gate) It faced the eastern direction towards the rising Sun. Royal Entry at Suraj Pole Gate on Elephant. 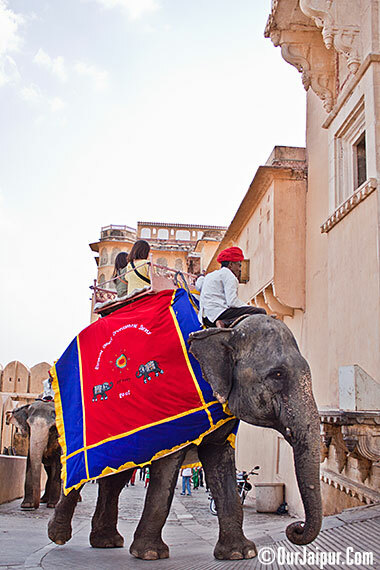 If you want to have a Royal Entry then you can hire an Elephant to take you to the palace above the hill. Suraj Pole Gate (Sun Gate) leads to Jaleb Chowk, which is the first main courtyard. Jaleb Chowk was the place where armies use to hold victory parades. Jaleb Chowk was built in the rule of Sawai Jai Singh (1693-1743 AD). 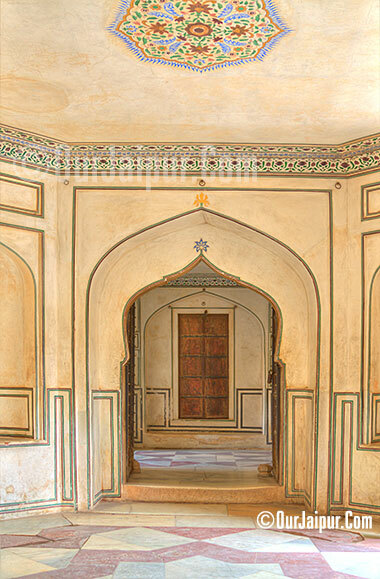 A big stairway from the Jaleb Chowk leads into the main palace or you can say second courtyard. 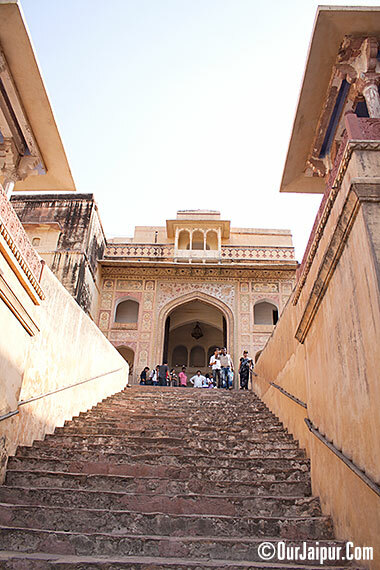 At the Right of that stairway is the Shila Devi temple (an incarnation of Kali or Durga) where the Rajput Maharajas use to worship and offer animal sacrifice. The animal sacrifice ritual was performed till 1980s. Ganesh Pol or the Ganesh Gate, named after the Hindu god Lord Ganesh who removes all obstacles in life which is decorated with mosaics and sculptures. Is the entry to third courtyard this was kind of private place for the Rulers. It was built by the orders of Mirza Raja Jai Singh(1621–1627) Above this gate is the Suhag Mandir where ladies of the royal family used to watch through the latticed windows functions held in the Diwan-e-Am. Ganesh Pol or the Ganesh Gate. While at Entrance from Ganesh Pol. 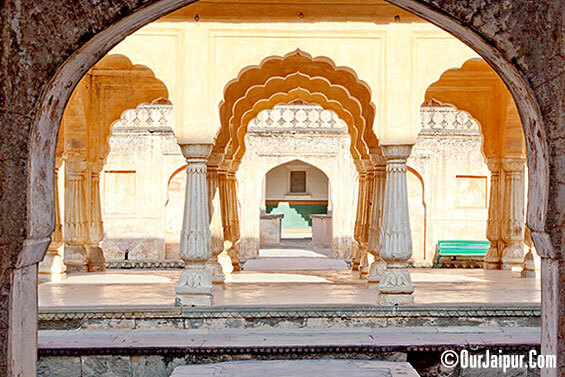 The third courtyard is where the private quarters of the Maharaja, his family and attendants were built. The courtyard has two buildings, one opposite to the other, separated by a garden laid in the fashion of the Mughal Gardens. 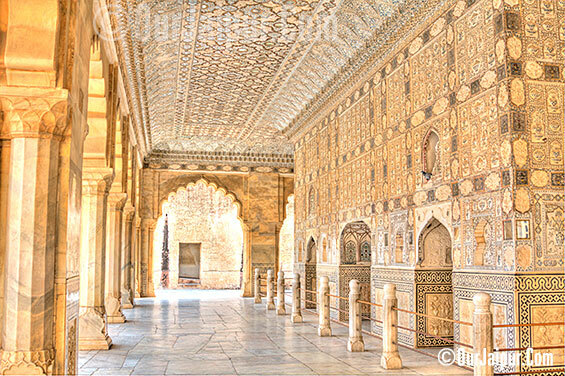 The building to the left of the entrance gate is called the Jai Mandir, Also known as Sheesh Mahal (mirror palace). 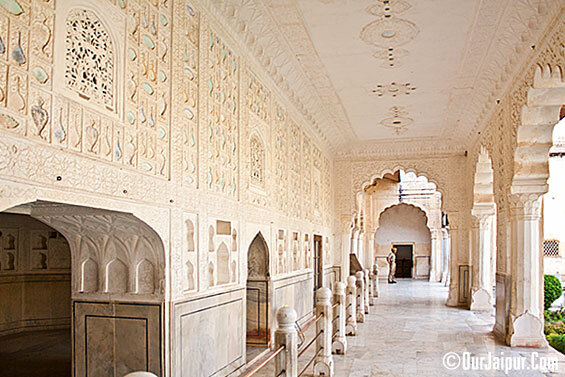 Jai Mandir, Also known as Sheesh Mahal (mirror palace). The other building seen in the courtyard is opposite to the Jai Mandir and is known as the Sukh Niwas or Sukh Mahal (Hall of Pleasure). A piped cold water supply used to flow through an open channel that runs through these rooms keeping the environment cool. Sukh Niwas or Sukh Mahal (Hall of Pleasure). Hindu Shashak Ki Palki on the roof of Jai Mandir. 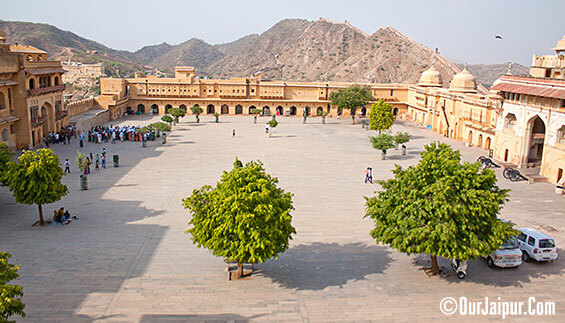 South of this courtyard lies the fourth courtyard or Palace of Man Singh I, which is the oldest part of the palace fort. 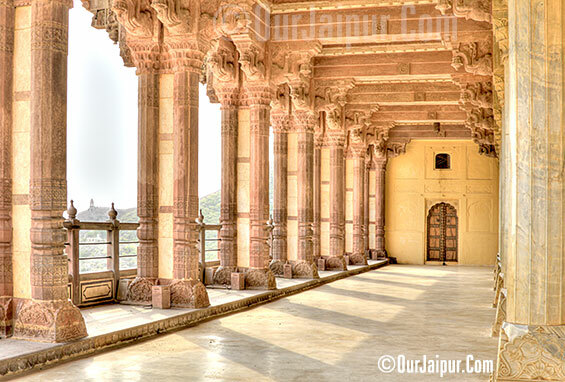 In the central courtyard of the palace is the pillared baradari or pavilion. 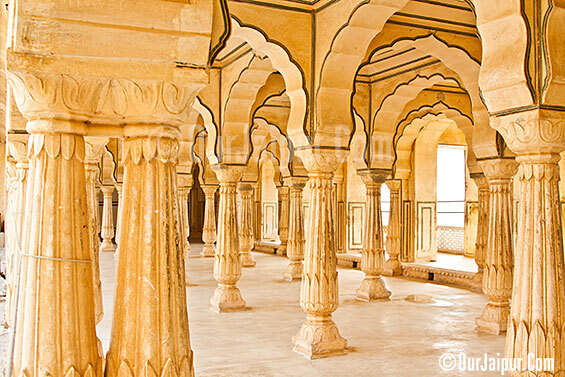 This pavilion was used as the meeting venue by the maharanis (queens of the royal family). All sides of this pavilion are connected to several small rooms with open balconies. The structure is developed in such a way that King can visit any room at any time without getting noticed by anyone else. 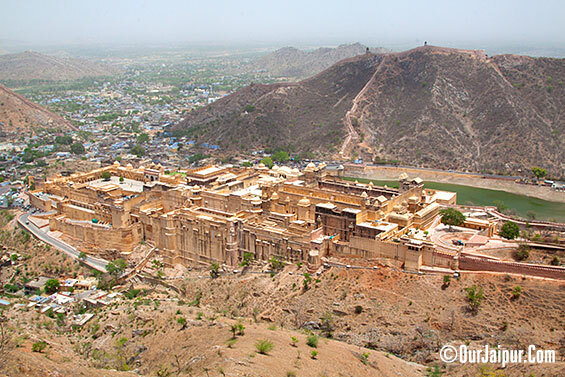 The exit from this palace leads to the Amer village, a heritage town with many temples, lavish houses and mosques. Baradari pavilion at Man Singh I Palace Square. There is also a Secret Tunnel connecting Amer Fort to Jaigarh Fort which is now open for public to watch, At some parts its open because of the wear and tear and at some parts its still closed. 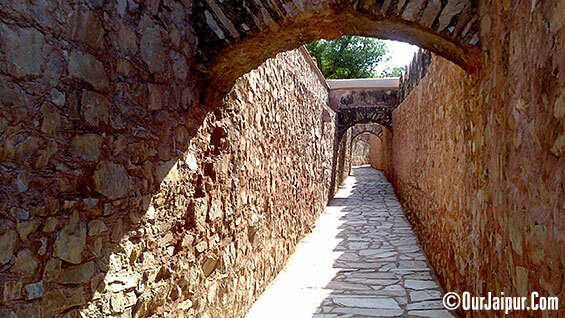 Secret Tunnel From Amer to JaiGarh Fort. 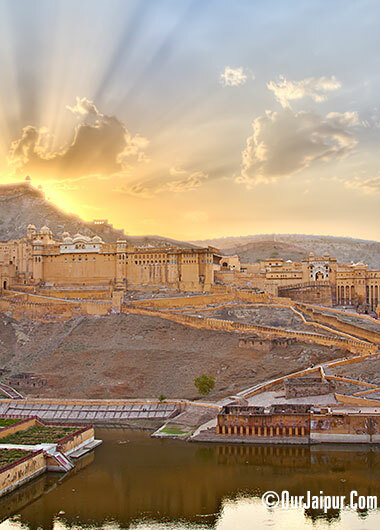 Amer Fort at the time of Sunset. Amer fort view during the night lighting. olha estou seguindo seu lindo e maravilhoso blog e ficaria mega honrada se pudesse retribuir. Lovely place and lovely photos, specially the photo at night. Simply stunning and thanks for the walk to all the lovely places via the pictures. I like the fort. Hope I will visit again. fabulous is the only word for these photographs and the detailed post !! Amazing post yeta again !! आमेर का किला मैंने देखा है परन्तु आपके कैमरे से ली गई तस्वीर अद्भुत है. Nice one, and those pictures are really beautiful..
Love your pink city and keep hoping to spot a Macaque in one of the photos. Fabulous post! beautiful description as well as inviting photographs. guauuu! que pasada! alucino con los lugares estos! me encanta! please ..... let me come back to this beautiful places once again ! heard of this fort... looks lovely!! hey do you have a search button on ur blog.. it will help search for information on a particular place..
As usual they are great!! Nice write up and amazing clicks! Tem post novo no blog flor! The architecture is just jaw dropping stunning. I can't get enough of it. That is just amazing! The richness of the buildings is breathtaking! superb pics. Have u tried HDR this time? I loved the strength! And the steps of the palace, great scenery! Just created a Facebook page for Cheers and Cosmos Photography Page be sure to Like it and share the love. I dream with your pictures! The architecture is a amazing! Wow is all I can say, while I watch the beauty of the architecture.